Expedia’s last CEO quadrupled the company’s gross values in travel bookings, doubled its pretax earnings, and was successful enough that Uber took him to lead that company through a rough time. Mark Okerstrom, formerly his right-hand man, is ready to take on the challenge. Mark Okerstrom sat 6 feet to the right of his boss, Expedia CEO Dara Khosrowshahi, for more than five years. But when Khosrowshahi left for Uber, Okerstrom was doing more than moving 6 feet to the left. He was succeeding the man who took his company from Expedia.com to Expedia Inc., with 17 brands and websites that include Hotels.com, Trivago, Orbitz, Travelocity and HomeAway. Under Khosrowshahi’s leadership, Expedia doubled its pretax earnings and quadrupled the gross values of its hotel and travel bookings. Everyone at Expedia says Okerstrom will carry the company in the same direction it’s been going — expanding the number of hotels they book in Europe, Asia and Latin America, acquiring more brands and websites, and staying on the edge of technology — especially in the expanding home-sharing market, where Airbnb currently dominates. The board didn’t even consider any other candidates, Expedia Chairman Barry Diller said in a statement. “This transition is as natural as water flowing down a snowpacked mountain,” Diller said. But Expedia’s fleet of websites doesn’t have open waters ahead of it. Priceline Group — owner of Booking.com, Priceline.com and Cheapflights — started outpacing Expedia in 2010, and by 2014 was bringing in almost $2.7 billion more in revenue. Expedia has since managed to close some of that gap, but if it wants to compete overseas, where Priceline’s websites get most of their revenue, Okerstrom will be playing in his rival’s court. There’s also competition from outside the hotel space — namely Airbnb, the home-sharing startup that has disrupted the hotel sector. Expedia is reaching into this market with its acquisition of HomeAway, which has an online marketplace similar to Airbnb’s, in 2015. But Okerstrom is measured and undramatic about these showdowns. “At the end of this, we’re both going to have all the hotels,” Okerstrom said. It will be the quality of Expedia’s customer service and its bundles — customers can use Expedia.com for the flights, Trivago for the hotels, CarRentals.com for getting places, Expedia Local Expert for recommendations, and Traveldoo for expensing it all — that will by used by Expedia to pull ahead of its competition, Okerstrom said. In the same way, Okerstrom doesn’t like characterizations that Expedia and Priceline are in a fight with hotels for revenues — even though hotel chains like Hyatt have been trying to launch their own online booking services. Okerstrom sees his relationship with hotel chains as symbiotic: Expedia can encourage its customers who liked their hotel to sign up for a loyalty program with that chain, or at least try it again next time. This kind of measured, details-oriented approach — where everything works out because all the parts work together — is the attitude Okerstrom brings to everything. The son of two teachers, Okerstrom grew up in Vancouver, B.C. He earned an MBA at Harvard University and then returned to Canada for a law degree from the University of British Columbia. He joined Expedia in 2006; before that, he was a consultant with Bain in Boston and San Francisco, and worked for investment bank UBS in London. When a recruiter called him about a position at Expedia, he took the job because of the deals and acquisitions Expedia was making. Within five years, he was in the C-Suite, making millions: Okerstrom’s total compensation for 2016 was $18.2 million, with $1.5 million in cash and the vast majority in Expedia option awards from the company, according to its regulatory filings. Okerstrom and Expedia haven’t disclosed yet what he’ll be paid as CEO. Former CEO Khosrowshahi received nearly $91 million in Expedia option awards, rocketing him for one year to the spot of nation’s highest-paid public-company CEO. But Okerstrom doesn’t like the characterization that he’s a “safe” choice or that he won’t take risks. Running a diverse, interconnected string of companies like Expedia’s requires experimentation to emerge on top. For instance, Expedia is hoping HomeAway can edge out Airbnb with instant booking. One of the downsides to booking an Airbnb versus a hotel is that the hotel can tell you right away whether or not a room is available. On Airbnb, you have to wait for the host to say yes — and sometimes, they don’t. HomeAway’s instant booking feature is trying to work around this, but it’s gotten pushback from homeowners and property managers who want to see who’s going to be living in their home before saying yes. Okerstrom also wants to offer more to the homeowners renting out their houses on HomeAway so they can see what similar properties are charging and eventually what hotels in the area are charging. 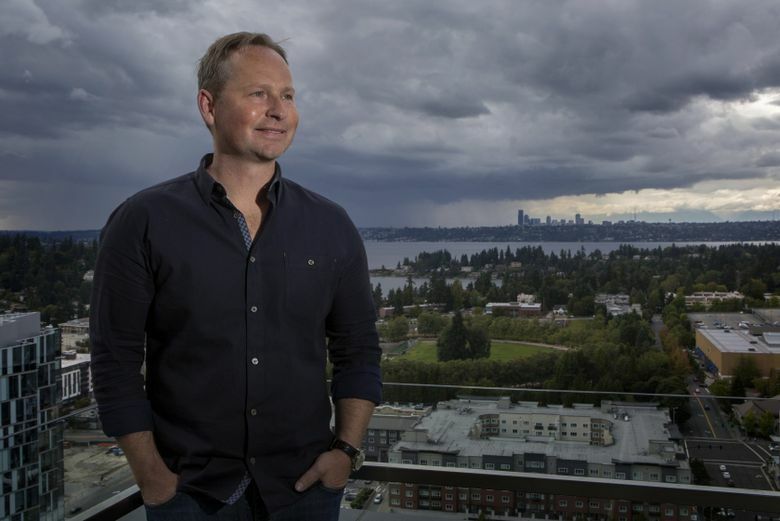 Another big change Okerstrom will oversee is Expedia’s move from Bellevue to Interbay in Seattle — a shift of thousands of jobs. He says the first wave should come in late 2019, with around 5,000 Expedia employees moving to the north end of Seattle’s waterfront. “We’re going to really beautify that area of Interbay,” Okerstrom said. That move will change the Interbay area — especially if, as forecasts say, the company grows almost 20 percent in the next five years. Okerstrom said he’s made mistakes in his time at Expedia. When he came on as CFO, he didn’t take a close enough look at Expedia’s consumer protection, leaving the company unprepared for a rise in credit-card fraud.